Why does this end up being such a healthy diet? Some reasons include the presence of monounsaturated fats in foods typically found in such a diet (i.e., olive oil), as opposed to the intense amount of saturated fat in a typical American diet. A very interesting conclusion in a 2003 study from The New England Journal of Medicine suggests that it may actually be the synergy between the foods of this diet that leads to the health benefits, not necessarily any one food or ingredient by itself. So what are you waiting for? Break out the olive oil, the nuts, and the red wine and start working a Big Fat Greek Diet! For this sandwich, I just take a whole wheat pita (check the packaging to make sure there’s no high fructose corn syrup added!) and spread the inside with hummus. 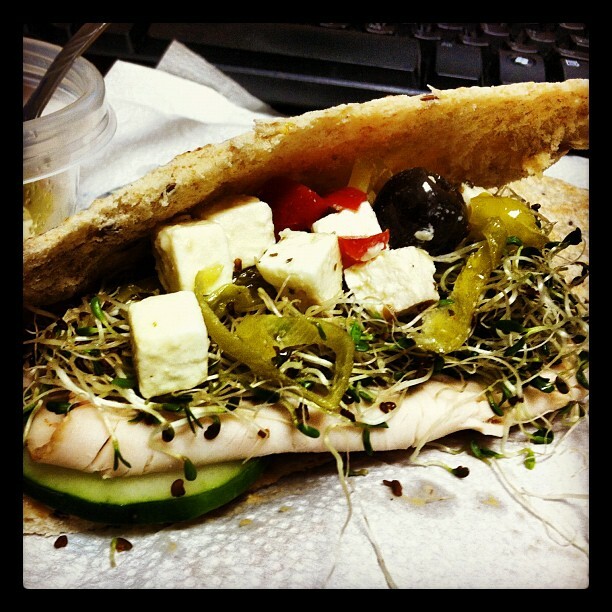 Then stuff it with cucumber slices, sprouts, and greek salad – which includes feta, olives, banana peppers, and olive oil. You can add sliced chicken or turkey if you want some meat (I’ve added Boar’s Head Everroast chicken breast to mine). Simple as that! Enjoy!